Welcome to the Videography Pages at 'Chaka's World'!! While the Discography Pages are loaded with MANY items, these pages are still in their infancy due to the limited number of Chaka Khan related videos released during her career. If Chaka's or any of her former recording labels ever decide to release her rare footage & performances, 'Chakaholics' would no doubt support them. Until that happens, we'll profile Chaka's many TV Appearances, recent DVDs, old VHS tapes, and even her Laserdiscs from the mid 1980's! 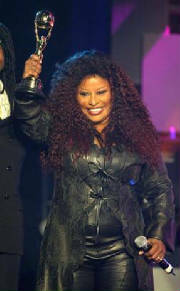 Chaka's appearances on other artist's videos & DVDs are also listed for your convenience. 'The High Priestess Of Funk'! !